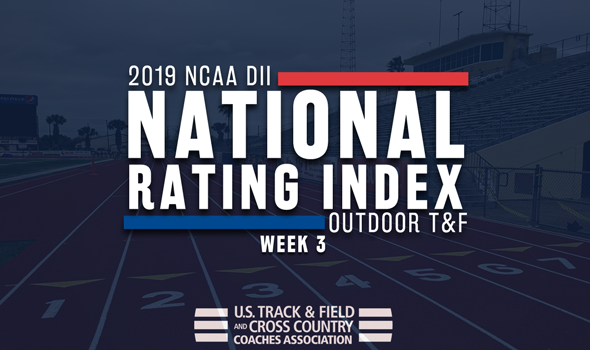 NEW ORLEANS – Can you believe it is already time for the Week 3 edition of the NCAA Division II Outdoor Track & Field National Rating Index, which was released by the U.S. Track & Field and Cross Country Coaches Association (USTFCCCA) on Tuesday. Don’t blink too fast or we might just end up at the 2019 NCAA Division II Outdoor Track & Field Championships, set for May 23-25 in Kingsville, Texas. Before we get there, though, teams have to navigate the rest of the regular season as they battle for the top prize. This week, the No. 1 ranking on the men’s side was held by the same program for the second week in a row, while the women’s chart was overtaken by a storied program that made their outdoor ranking debut. Keep reading below to see who is slotted where in the latest national ratings. The next National Rating Index for both men and women will be released on Tuesday, April 9. Remaining atop the charts for the second week in a row was Angelo State as the program after a successful weekend at the Texas Relays. The Rams were led by their field athletes at the meet, as they saw Harry Maslen post the top score in the country in the decathlon while Alexandros Spyridonidis and Dragan Pesic were right behind him to rank in a tie for fourth in the nation in the same event. Nils Fischer also had the second-best mark in the javelin so far during outdoors. It is the first time in school history that Angelo State has been No. 1 for consecutive weeks. Jumping up two spots to No. 2 was Saint Augustine’s after the Falcons also did battle against NCAA DI schools at the Florida Relays over the weekend. Top marks for Saint Augustine’s went to Nathan Fergusson (tops the country in the 400H), Alazae Hester-Taylor (second in the 400H), Brandon Parris (third in the 400), Darren Alfred (fifth in the 400) and Jalen Jones (ninth in the 400). The program’s 4×100 and 4×400 also ran the best times in the nation so far this season to go with Najair Jackson who is now ranked third overall in the javelin. It is the best mark received by the program since Week 10 of the 2016 season. Climbing up four spots to No. 3 was West Texas A&M who spent the weekend spread out across the Raleigh Relays, the Texas Relays and the Bobcat Invitational. Standouts for the Buffs included Abraham Seaneke (tops the nation in the triple jump and second overall in the long jump), Quinton Sansing (second in the 400), Lorenzo Johnson (third in the 110H) and William Frobe (fifth in the 400H). It was the best mark received by West Texas A&M in program history. Advancing up one spot to No. 4 was Academy of Art after performances at both the Florida Relays and Mike Fanelli Track Classic. The Urban Knights were led by Victor Moreau (second overall in the 1500) and Freddie Hessian (sixth in the 5000). The groups 4×100 also posted the third-best time so far this season and the 4×400 squad is now ranked sixth overall. It was the best rank received by the program since opening the 2017 season at No. 1. Joining the top-five for the first time at No. 5 was Grand Valley State who finally debuted on the charts after opening up their outdoor campaign this past weekend. The Lakers were ready to roll as Zach Panning (now leads the nation in the 10,000) and Dennis Mbuta (second in the 800 and third in the 1500) among others had successful openings to outdoors. Because the NCAA DII National Rating Index only takes into account current season performances, it is the first time this year the Lakers have been able to join the ranks. The rest of the top-10 was rounded out in the following order; Embry-Riddle (Fla.), Texas A&M-Commerce, UC San Diego, Chico State and Findlay. In review, 21 of the top-25 programs from last week had some kind of shakeup. The biggest leap in the top-25 was taken by No. 18 Carson-Newman after a 41-spot improvement. Other big improvements were seen from No. 49 Chadron State (up 88 spots) and No. 65 Malone (up 69). Grand Valley State finally kicked off their outdoor season and took over the charts as the Lakers were named the No. 1 program in this week’s edition of the National Rating Index. The group posted top performances across all disciplines this past weekend at the Florida Relays, the Raleigh Relays and the Embry-Riddle Spikes Classic, which included Allie Ludge (leads the nation in the 1500 and sixth overall in the 800), Rachel Walters (second in the 800), Gina Patterson (second in the 5000), Madison Goen (third in the 5000), Hanna Groeber (fourth in the 10,000) and Jessica Eby (fourth in the 400H). The team’s 4×100 and 4×400 units also posted times that rank them sixth overall nationally. This is the first time that GVSU has been ranked No. 1 since Week 6 last year. Holding steady in the No. 2 spot was SF State after spending the weekend at the Stanford Invitational and Mike Fanelli Track Classic. Top showings went to Alexis Henry (fourth in the 200) and Jazmine Smith (fifth in the 400) who each posted top-five teams in their respective events. Leaping up a single-spot to No. 3 was West Texas A&M. The Lady Buffs were led by Fatim Affessi (tops the nation in the long jump and fifth overall in the triple jump) and their 4×400 unit (now eighth in the country). Falling three spots to No. 4 was Angelo State. The Rams added three new performances to their ledger, which continue to include Daisy Osakue who is No. 1 in the country in the discus after another strong performance. Jumping up nine spots to No. 5 was Missouri Southern after splitting up between the Washington University St. Louis Invite and the Oral Roberts Invitational. The Lions added a bunch of new marks to the National Rating Index with the best of the bunch going to Emily Presley (now second in the country in the pole vault) and Morgan Smith (sixth overall in the 100H). It was the best mark received in school history for the Missouri Southern program as the team cracked the top-5 for the first time. The rest of the top-10 was completed by Alaska Anchorage, Saint Augustine’s, Academy of Art, Simon Fraser and Pittsburg State, in that order. In total, 22 of the top-25 teams experienced some kind of movement with the largest gain taken by Colo. School of Mines (up 87 spots). Other big improvements were taken by No. 28 Virginia State (up 79 spots) and No. 68 Saginaw Valley State (up 66).